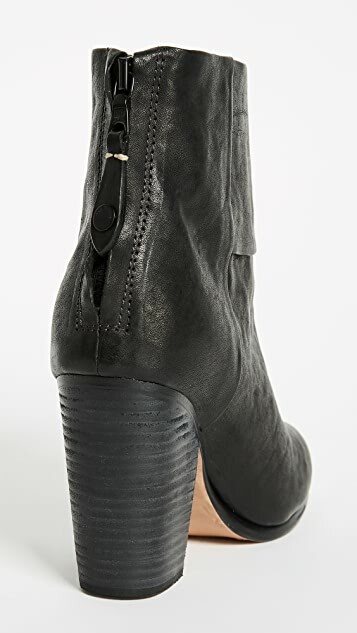 Artful seaming contours these signature leather Rag & Bone booties perfectly to the foot. The rounded toe is seamed at one side, and the paneled shaft is finished with a hidden zip at the back. 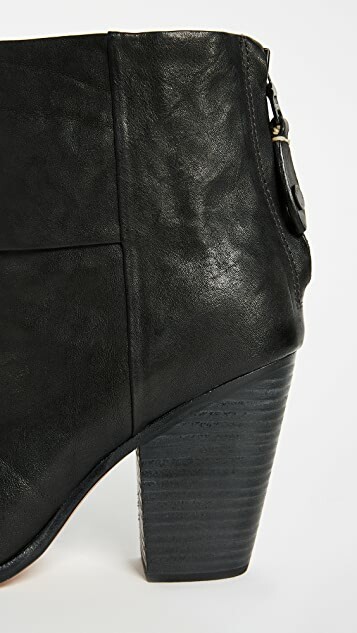 Stacked leather heel and leather sole. I had been looking at these boots for quite some time before I saw them on sale and went for it. I am a little apprehensive to buy shoes online because sizes are all over the place these days and what was previously a firm 37.5 can be anything from 36 to 38 now. 37.5 are perfect and they look great. 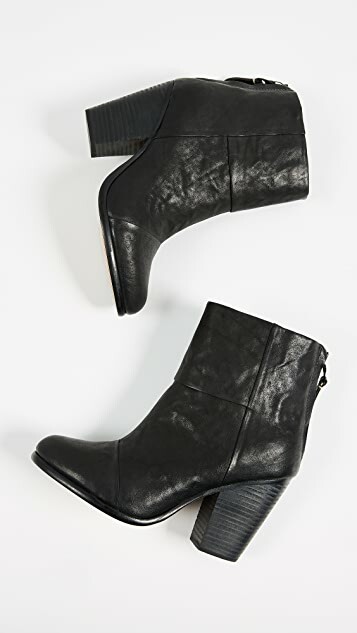 My new favorite booties. 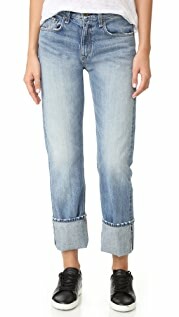 I normally wear size 7 US or 37 EUR but I sized up to 37.5 in these and they are perfect. I wear them 4-5 times a week. Another satisfied customer! 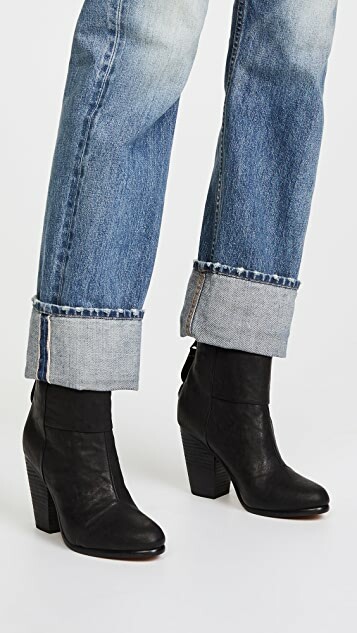 I wear these boots all the time, I got them during a SHOPBOP sale but I would have paid full price for them. Comfortable and well made, I have a wide foot and purchased my true size, they will stretch a tiny bit. I bought this pair of boots in brown 2 years ago and I was so in love that I just recently bought them in black. I'm a true size 6.5 and 6.5 fits perfectly, even with socks. They're comfortable for walking in, but at the end of the day, the ball of my foot hurts a bit, but that's really with any heel that isn't a wedge. Overall, fantastic quality for this price. Definitely size half size up. I am a true 7 and always get a 7.5. These are the most comfortable boots ever!! I wear these almost every day. So comfortable and make everything look great. The quality is excellent, I have one other pair that I have had for two years with very little wear and tear although also worn frequently. A worthy investment. When I first put these booties on, I was nervous I had purchased the wrong size. I have a narrow foot, and I'm not used to shoes actually fitting! I bought my true size, and I have worn them every day since I received them. The shape is super flattering, and they feel quality. I don't know that I would have paid full price for them, however! The ball of my foot does get a little sore, but that's with a lot of walking, and probably standing too forward. All in all, these boots are even prettier and more flattering in person, and run true to size in length, and slightly narrow in width. My second pair for Newbury. Perfect as always. What's all the hype about? I got these based on the reviews that they were comfortable. I normally wear a size 7 and my feet are wide. So I got the size 9. The 9 was a bit long and the front of the boot was still a bit tight. I tried the size 8 and they were too tight. In addition, this boot was not comfortable at all. 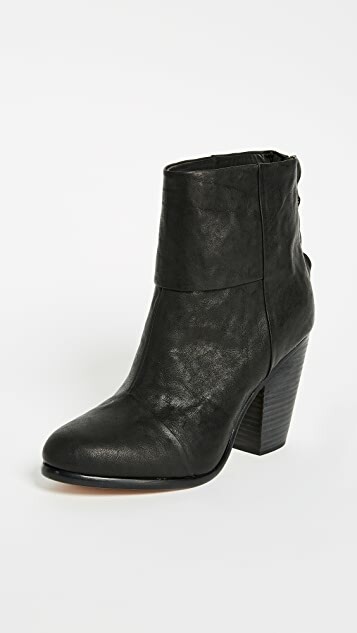 Maybe the reviewers that like this boot have tiny, narrow feet. Because I don't understand all the hype. best boots i've had though the heel is relatively high for me.